This photo of a Datura bloom was taken in the early evening, soon after it had opened. In the background of the Datura are blanket flowers (Gaillardia aristata). Datura wrightii is Datura’s full scientific name, but it may also be known as Jimsonweed, sacred thorn-apple or angel trumpet. The flowers are amazingly fragrant, with one of the best floral scents available in the xeric garden. The striking flowers begin to open at the start of night fall, and close up and wither soon after sunrise the following morning. In its native habitat, night flying moths are its main pollinator. Scientists report that the hawkmoth (Manduca sexta) is Datura’s typcial native pollinator (http://aob.oxfordjournals.org/content/103/9/1435.full.pdf), and also one of its main consumers as the moth larvae feed on the plants tissues soon after hatching from their egg cases. In my garden, I mostly observe European honeybees visiting the flowers early in the evening before their day is done. The bees can be seen anxiously and voraciously trying to get into the nearly opened flowers. 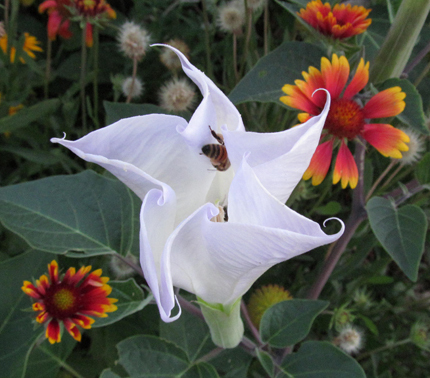 The plant’s flowers exert a hypnotic draw to the bees who are dwarfed by the Datura bloom’s size. In my photo you can see a honey bee who’s happily made it into the flower. Datura’s are easy to grow in average soil with full sun. They are easy to start from seed, as evidenced by the many seedlings you might find popping up around your xeriscape beds. Datura is usually classed as an annual in most areas of Colorado. But I’ve got a couple plants that have become perennial in one of my flower beds. Every year I have several plants that come up from seed. Datura is said to be a source of hallucinogenic compounds, but that seems to be in dispute. What is not in dispute by horticultural experts is that all parts of Datura plants contain “dangerous levels of anticholinergic tropane alkaloids and may be fatal if ingested by humans, livestock or pets.”(https://en.wikipedia.org/wiki/Datura_wrightii) Even more shocking is the connection of Datura wrightii’s cousin, Datura stramonium to the creation of slave zombies in Haiti. So don’t ingest the Datura, just observe their beauty and admire their fragrance as you enjoy the late summer evening.